With this calculator, you can calculate flow rate or pressure drop of any gas that flows through round closed pipe. This calculator is suitable for any gas including air, natural gas, methane, carbon dioxide, oxygen, nitrogen, or any other gas. 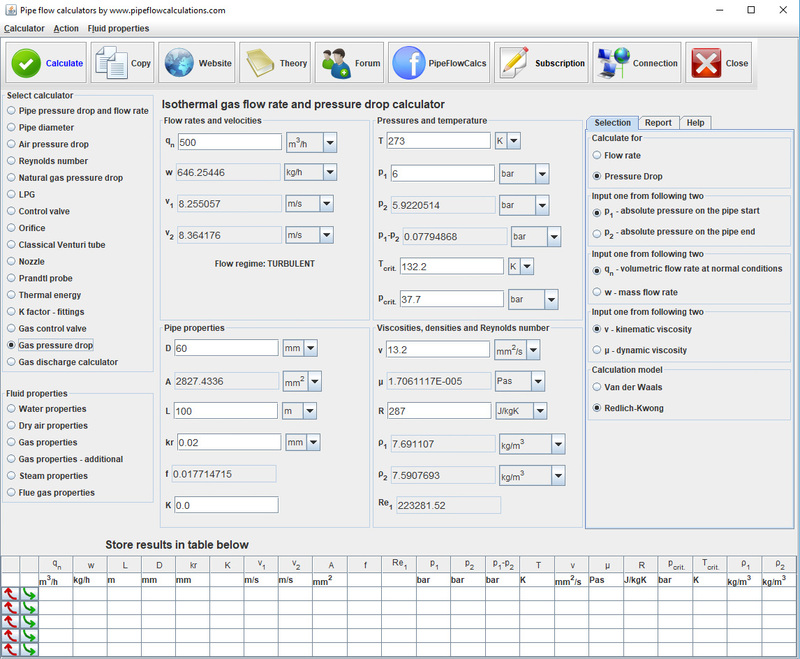 You can use this calculator for laminar and turbulent flow regime. A temperature of the gas is considered to be constant, regardless of created pressure drop. This assumption is valid only for relatively long pipelines without any sudden changes and pipe thermal insulation. During slow, steady flow, if the temperature of the fluid drops due to the pressure drop, this calculation model assumes that fluid takes heat from the surrounding. This heat taken from the surrounding keeps the temperature of the flow in the pipeline constant. The calculator uses a pressure drop equation for isothermal flow. To calculate the pressure drop, the calculator performs friction factor f and minor resistance coefficient K calculation, as well as the mean velocity of the flow on the pipe start and the pipe end. The calculator includes Reynolds number (Re) calculation, as well as compressibility factor (Z) for gases that are not performing as ideal. Also, the calculation is performing friction losses (f) and minor losses factors (K), needed for pressure drop calculation. Calculator presents values of Reynolds number and flow regime - laminar or turbulent, as well as calculated densities on the pipe start and the pipe end. This calculator is not suitable for adiabatic flow when the temperature is changing due to the change of pressure. It means that you can't use this calculator where you expect for sudden changes pressure due to flow restrictions, sudden change of the flow direction and similar conditions. The calculator is not considering a change of the height in the calculation. For pressure drop calculation you must enter flow rate and pipe diameter. For flow rate calculation, you must enter pressure drop and pipe diameter also.